Delrey Metals has acquired five highly prospective properties in Canada. Four are prospective for vanadium, for a total of 9,482 hectares, and one is a cobaltcopper-zinc opportunity that Cobalt 27 Capital Corp. acquired a 2% NSR on. All four vanadium assets will be receiving airborne magnetic surveys and geophysics in February. Subject to results, management will determine which properties to focus on. Both the Porcher and Blackie properties have unique features that if confirmed, will likely make them top priority targets for the next phase of exploration. 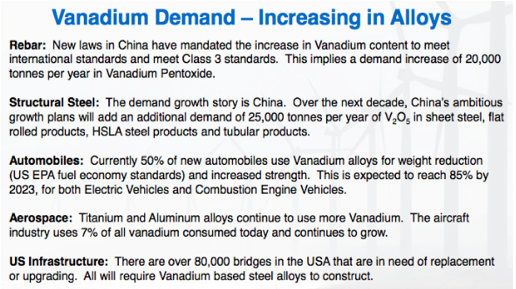 Interest in vanadium has grown along with the price. 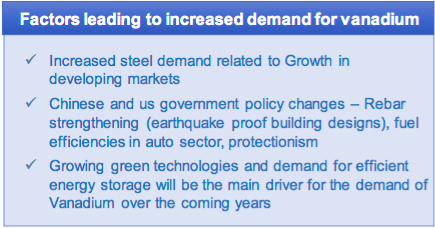 Demand from China continues to be the key driver. While the rest of the world grows at 2%3% per year, a bad year for China is +6%, and it’s the second largest economy on the planet. Not only does China use a tremendous amount of steel, it uses huge quantities or rebar, which is used in construction and infrastructure building (and rebuilding). Regarding vanadium pentoxide pricing, there’s been a lot of angst over the recent dramatic decline, but Chinese prices seem to be settling in around US$17/lb. The chart above shows a price closer to US$15/lb, but the price was US$16.90/lb as of February 3rd. It topped out at nearly US$35/lb in November, so the price has been halved from a 13-year high. Importantly, US$17/lb is still a strong price, up from a low of US$2.35/lb on 12/31/15. From $2.35/lb, the Chinese vanadium pentoxide price has risen at a 3-year CAGR of ~93%. A price between US$15US$25 is a sweet spot, too high a price and VRBs get priced out of the market. Vanadium is primarily used (91%) to strengthen steel rebar (two pounds of vanadium added to a tonne of steel doubles its strength); last year China came out with new regulations for Chinese rebar makers use more vanadium! However, reportedly, 30%40% of Chinese rebar producers did not follow the regulation implemented in November, which was likely a big factor in the vanadium price crash. The increased demand from this initiative alone is estimated at 10,000 tonnes per year. That’s on a global market of about 90,000 tonnes. 10,000 tonnes/year is what Largo Resources’ main mine in Brazil produces, one of the largest mines in the world. Quickly on the supply side there have been mine closures dating back to 2015 that are impacting the market. In 2015 a major Brazilian company liquidated, closing the Evraz Highveld mine, representing 10%15% of global vanadium production. However, at the time the inventory of vanadium was high, so there was a limited price reaction. And then there’s Vanadium Reflux Flow Batteries (VRBs). They represent just ~1.5% of the global vanadium market, but some pundits have large, grid-scale energy storage growing at a CAGR of up to 40%. 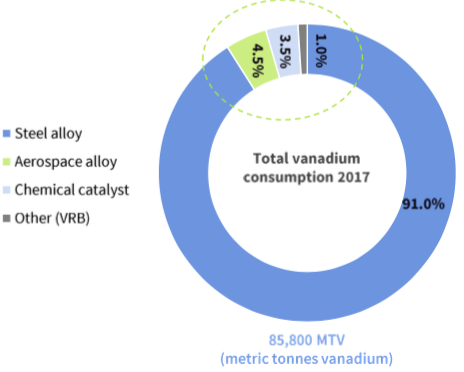 Roskill forecasts vanadium use in VRBs to be 31,000 tonnes by 2025. If true, VRBs would be a significant demand driver, easily overtaking the uses in aerospace and chemical catalysts combined. 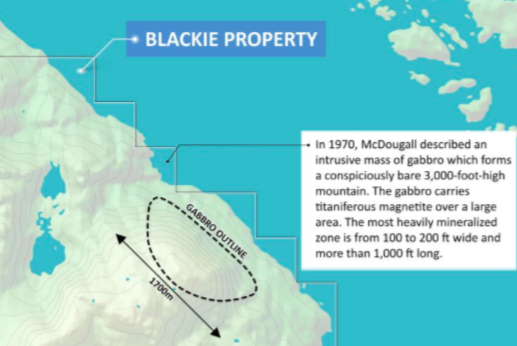 The Blackie Vanadium property is in west-central British Columbia, ~96 km south-southwest from Prince Rupert. The property is on Banks Island and is accessible year-round. It is located on tidewater, accessible to the Prince Rupert deep water port, which allows for an eight-day trip to North American West Coast ports. There’s a network of logging roads (<500 meters away) allowing for low-cost exploration and development. Assays from samples collected by McDougall (1984) ranged from 20% to 25% iron, 1.1% to 1.9% titanium, and up to 0.33% V (0.59% V205). Concentrate results made from these samples returned 0.5% to 1% V (0.89% to 1.78% V205). Individual outcrop results from a previous operator returned up to 49% Iron, 7.0% Titanium and an extremely anomalous 1.2% V (2.14% V2O5). “Several million tons of Iron-titanium-vanadium bearing material are known at this locality” 1 (Rose and Mulligan, 1970). The Porcher property is located in west-central BC, ~38 km south-southwest from Prince Rupert. The property is located on Porcher Island and is accessible year-round. There’s a network of nearby logging roads, allowing for cost-effective exploration and development. Porcher consists of seven tenures covering 3,122 hectares, open for expansion in multiple directions. The property is located in a past-producing mining district. The Surf Point Mine, located ~9 km from the Porcher property, operated from 1919 through to 1939. As with the Blackie property, Porcher is located on tidewater, less than 39 km from Prince Rupert’s deep water port. 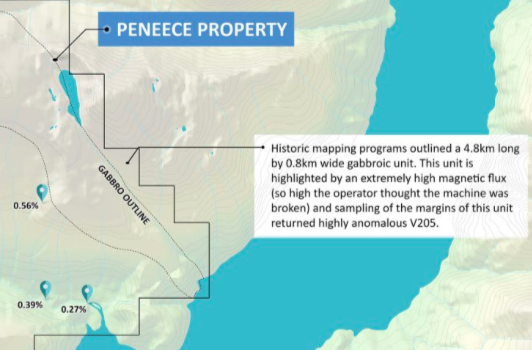 The Peneece Vanadium property is in southwest BC, a narrow coastal mainland fjord 85 km east of Vancouver Island. The property consists of five tenures covering 1,500 hectares, open for expansion in multiple directions. Peneece is located along tidewater and is accessible year-round. There’s a network of logging roads within the center of the project area. Access problems prevented sampling of the highly magnetic core, and only marginal material samples were obtained. Concentrate results from these samples graded 0.16% to 0.33% V (0.29% to 0.59% V205  AR 12204) and up to 6.5g/t Ag, a precious metal not typically found in these systems. The Sunset Property consists of four mineral titles covering 785 hectares. The area had exploration work done in the 1970s1980s. 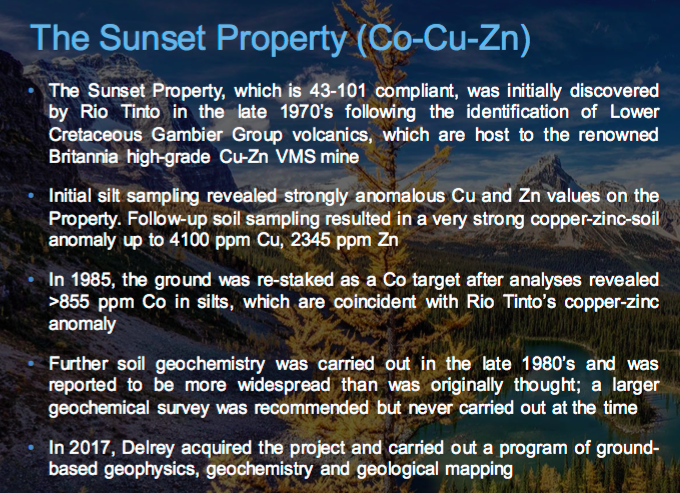 Several cobalt-copper-zinc soil geochemistry anomalies were discovered. In 1987, Decade International outlined a large cobalt‐copper‐zinc anomaly.